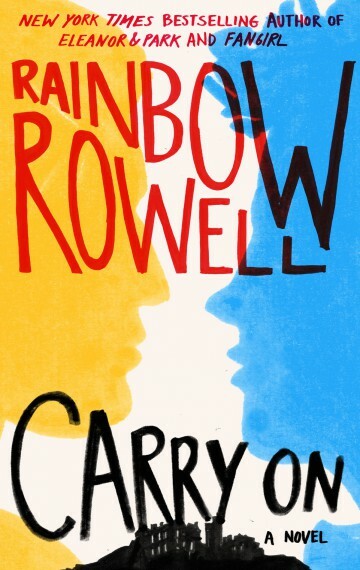 I put off reading this book for months, even though Rainbow Rowell is my favorite YA author (and one of my favorite authors, period). I was just not excited about her writing about the Harry Potter-esque characters one of the characters in Fangirl wrote fanfiction about. I felt that I knew what that story would be, and that I didn’t need a book about it. I also worried it would feel fan-fictiony, and that it would be romance-driven and boring. 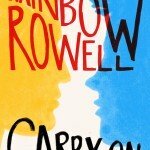 Carry On takes the Chosen One/magical boarding school/hero tale and twists it. In the last 2 or 3 Harry Potter books, J.K. Rowling pushes your expectations of the hero tale structure, casting doubt on the assumptions you held for the majority of the series and proving that some of them were wrong. 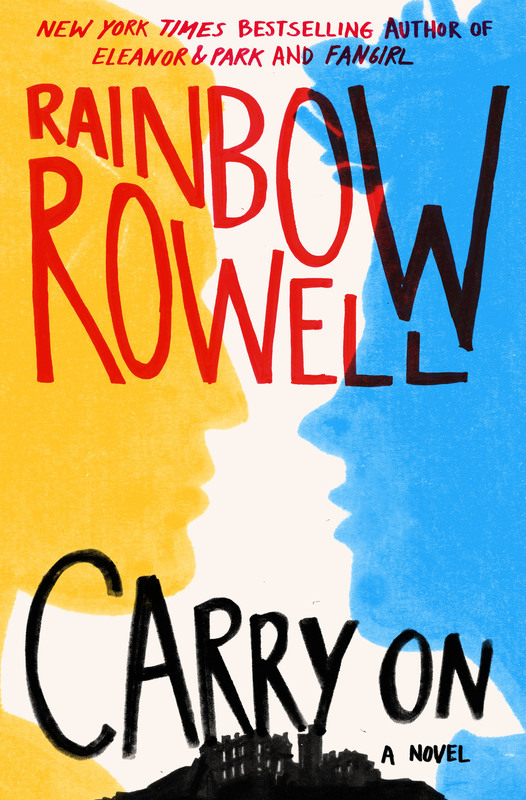 In Carry On, Rowell introduces a world and a story structure you think you know, adds in doubt, and blows everything to pieces. It’s a hero tale story, sure, but it’s just as much about the politics and maneuverings around the hero, which gives a kind of meta frame critiquing the hero tale as a whole. (Which, in this Classics major’s opinion, makes it much truer to the original hero tale in ancient epics, where gods and goddesses actively manipulate events.) And Rowell does all of this in one book. I should have known better to doubt Rowell–her characters, as always, are vivid and engaging, and even the ones I don’t like are ones I want to spend more time with. She has a smart, casual take on the existence of magic in a world of Normals; the way she integrates the two reminds me a lot of Lindsay Ribar’s work (she has a new book out, by the way, which I am dying to read and review). I also hugely appreciate the diversity in this book (which is also typical of Rowell): there are characters who are biracial and LGBT, and there is a remarkable number of prominent female characters–for any book in general, really, but for a fantasy novel in particular. The central relationship is between two boys, and it’s great to see that kind of representation in YA fantasy (…or YA in general, or fantasy in general). The book is YA, but there’s nothing more graphic than occasional swears and a lot of kissing towards the end, making it completely appropriate for middle school. This would be a pretty long class novel, but it’d be doable with a unit on mythology/hero tale narratives that could also accompany learning about Ancient Greece in Social Studies–it’d be an interesting alternative to The Lightning Thief which is what I read with my ELA classes. There are definite advantages and disadvantages to each, and I think Carry On would work better with a class who can handle a challenge, and/or with a lot of time spent on hero tale narratives, given how it messes with the structure. After I’ve been teaching for a bit longer, I would seriously consider using the book with my unsupported class, and The Lightning Thief with my supported class. I might write up something later comparing using the two in that kind of unit, in case anyone would be interested in teaching Carry On or is looking for an alternative to The Lightning Thief. This is a perfect example of how decoding and comprehension/appropriateness don’t always line up. A 4th grader reading on grade level could absolutely read all the words in this book, but I don’t think that 4th grader a.) would understand a lot of the bigger issues in the book; b.) would be interested in any of the relationship drama, or understand much of it; and c.) should read a book with a normal level of casual teenage swearing in it. This is a book meant for teenagers, and it’s completely developmentally appropriate for even 6th grade (and some 5th graders, depending on the student), but not 4th. However, the fact that the AR level is 4th is great, because it’s accessible to middle schoolers who are below grade level in reading, and it’s another point in favor of using it as a class novel. - Diversity in a fantasy novel! - Obeys and subverts the hero tale structure! - Teen interest; middle school appropriateness!